Looking to throw a fabulous party they'll create unending memories? Hazel helps you do it. 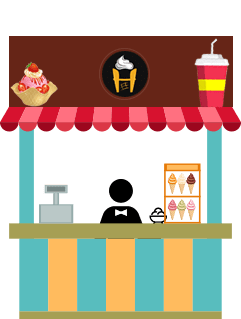 We cater to large and small events with our delicious ice creams, cakes and more.Surprise your family and friends with an Ultimate Ice Cream Experience from Hazel Ice Cream. Be it an Ice Cream Wedding Cake, an Ice Cream catered birthday Party, a corporate event, or a School Carnival, We have specially Customized Catering Programs for all. Just add your details to the form below and expect a call from our Catering team within 24 to 48 hours.